In my last posting, I pointed to the need to examine the relationship between three of the most important actors in the building of nations: Citizens, government and media. I suggested we examine what operates in the more developed societies and see if there were any lessons Africa could draw from their experience. The relationship between government and media should be seen not in terms of people and sentiments, but of roles and responsibilities. Both are tied in a governance loop with citizens. 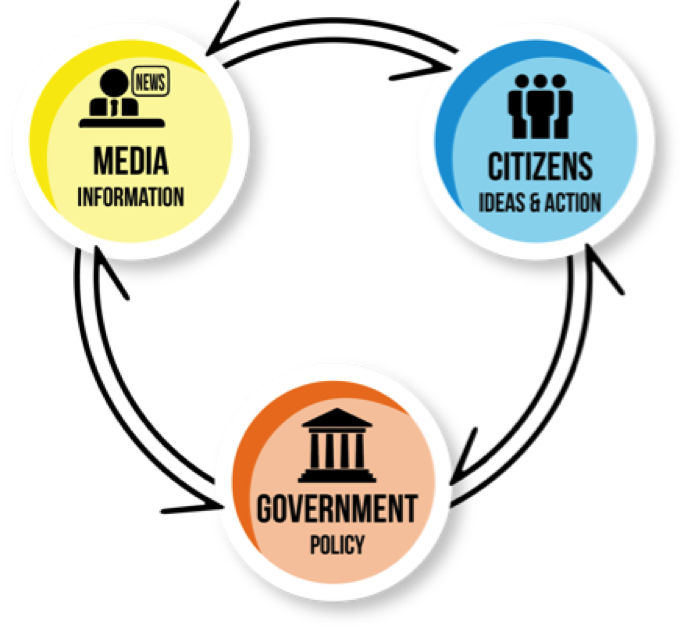 Media curates the information that citizens need to generate the actions and ideas that inform the policies governments have to develop and implement. Their actions sit within a circular knowledge continuum (the loop) that has citizens playing the roles of encoder and decoder. In a perfect state, media would feed into the system, providing the information that citizens need to generate the actions and ideas that fuel the policy machine of government. Western and other developed societies operate a version of this, especially in crisis situations. An example will suffice. Early in the summer of 2015, European society had to deal with two overriding issues that questioned the fundamentals of its communal existence: The Greek question and immigration. The two issues became the staple of media and the overarching concerns of government. Media provided the latest updates, debated the options, and kept the stories in the headlines as governments held interminable meetings on what to do about both issues. Citizens in Greece took to the streets when necessary to react to what was coming to them and voted in ways that informed government action. The governance loop was respected and functioned as it should. African societies are, for the most part, in a permanent state of crisis. There are multiple reasons for this and range from state fragility, terrorism threats and external economic shocks to social discontent. A number of issues could just as easily provoke a crisis. In any given country, these could include food insecurity, youth unemployment, climate change effects, power shortages, or institutional weaknesses. These developmental challenges have often provoked an existential crisis in one country or the other. Yet, a recent study by the African Media Initiative concluded that development reporting accounts for less than 10 percent of total media coverage on the continent. The gap remains extremely wide between media content and Africa’s development agenda, and the bulk of media fare is skewed towards entertainment and sensational politics. It is important to ask the question: How well does media in Africa play its role within the governance loop? Does it contribute to that ultimate goal of raising the quality of life on the continent? Some will argue that these questions are irrelevant to what is essentially a business – the news business – that should have no other parameters than the need to survive in a highly competitive environment and to make a profit. This will be the subject of a debate that I plan to generate in a forthcoming segment in this series on the Purpose of Media in Africa.